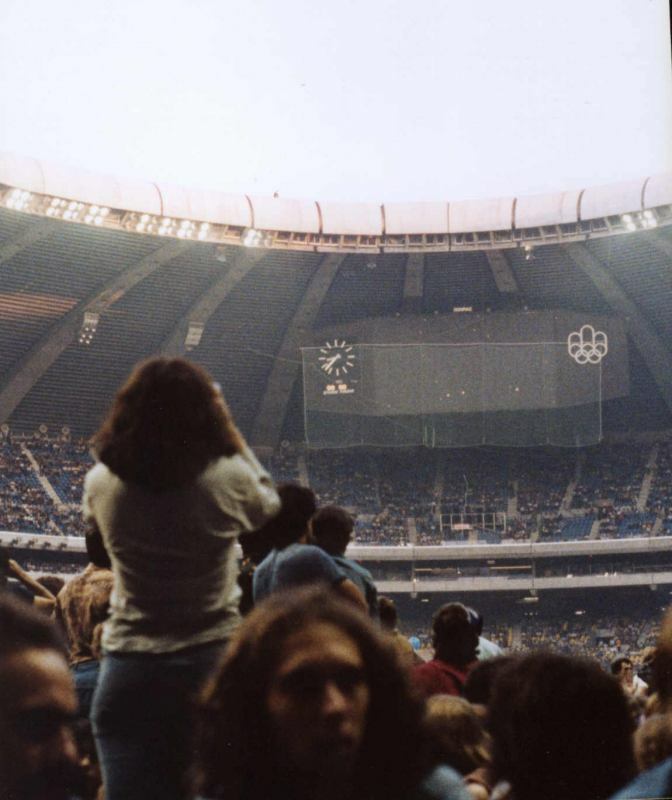 With huge thanks to Wray Ellis, we have the pleasure in sharing with you his exclusive, unpublished pictures and memories of that fateful day in July 1977, when the Floyd hit Montreal's Olympic Stadium, when a fan was at the receiving end of a very unlikely Roger Waters souvenir, and a number of bricks were cemented into a particular Wall. You will appreciate from the picture immediately beneath this text, just how close Wray was. This particular picture was taken just moments before the "spit"... Click on any image to launch a larger version. Wray is a writer and producer, and can be contacted via Davisvilleproductions.com. All text and images are © Wray Ellis and any unauthorised use is prohibited. 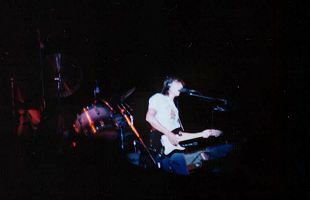 In July of 1977, I was 19 and already a seasoned Pink Floyd fan. 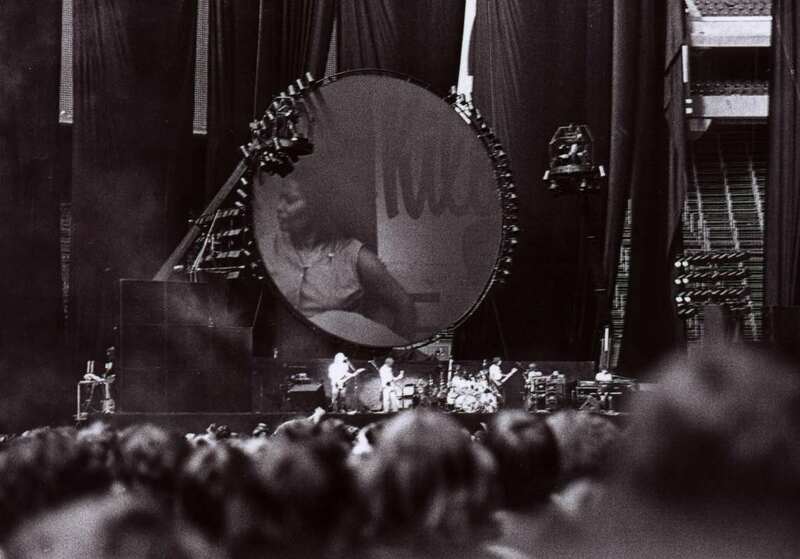 When I spotted an ad for a bus charter to see Pink Floyd live in Montreal, I rushed to buy a ticket. I was studying photography in college so I decided to take my camera and make it a journalistic endeavor. I’d seen them before in Hamilton (1975) and I thought I knew what to expect. 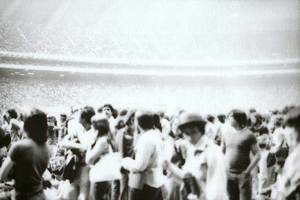 But when we arrived at Olympic Stadium, I realized that this show would be in a whole new league. I snuck off the main pathway, gestured my way past a French-speaking security guard and found my way onto the field. Within seconds, I was at the foot of the stage with a completely unobstructed view. I thought I’d be with other photographers but I saw none. 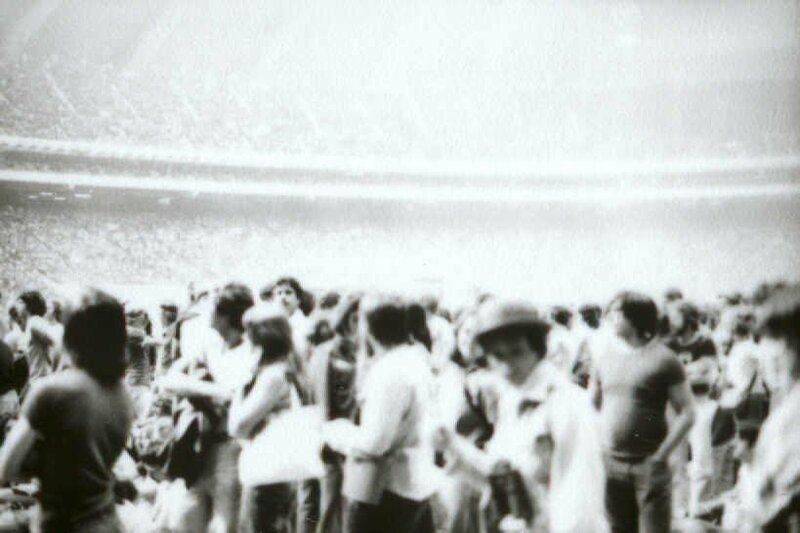 On my way through the crowd, I did see a guy wearing a large reel-to-reel tape recorder. It was a home deck modified with a battery pack and a neck strap. Two microphones poked out from his ball cap. At the time, I thought he must be some kind of nut. Today, I’d like to shake his hand. 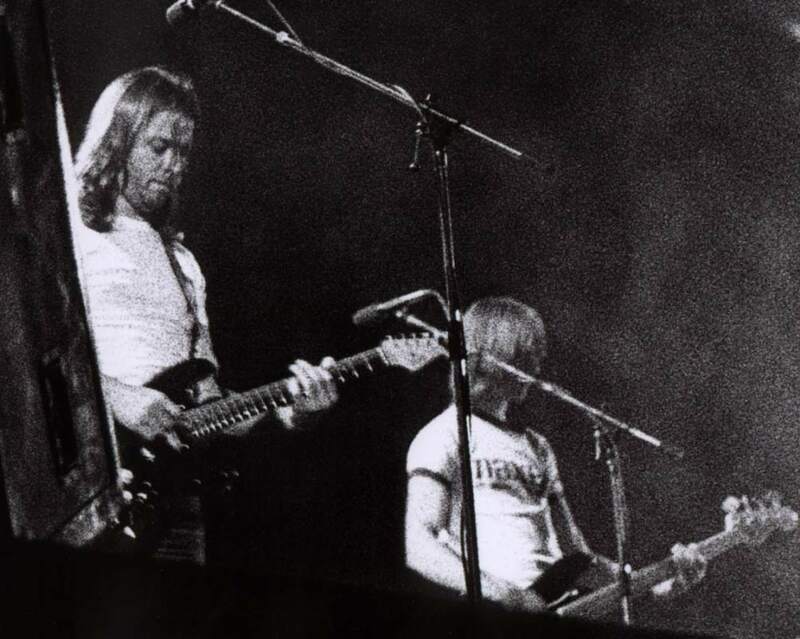 Sheep: As Roger Waters* began the signature bass intro, David Gilmour strapped on a pre-‘71, all-black Strat with white knobs and 2 white pick-ups. (A black pick-up was installed at the bridge position). I was surprised to see an extra player on stage. 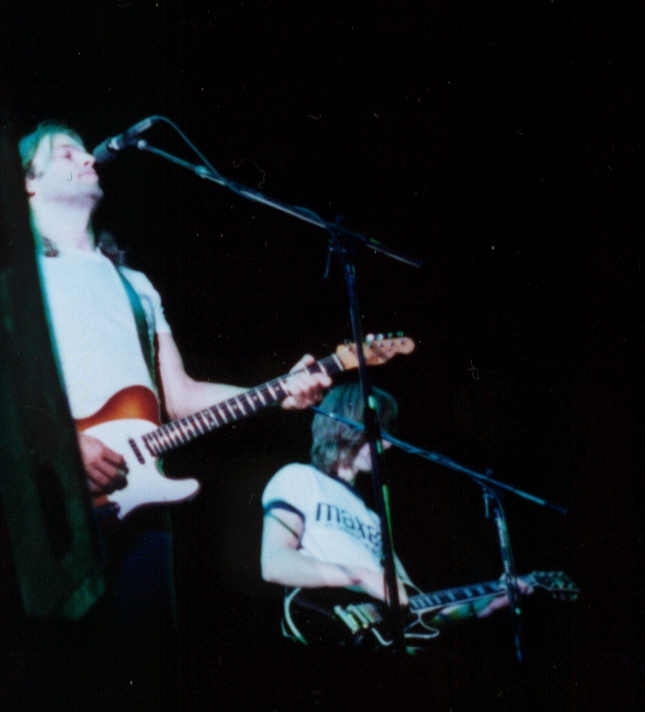 Snowy White, so my program said, played a black, 3 pick-up Les Paul. A fair player, Snowy added background under David’s crunchy solos. 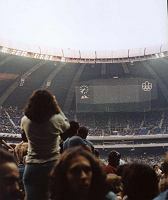 When the song finished, the first roar from the assembled 85-90,000 attendees was startling. 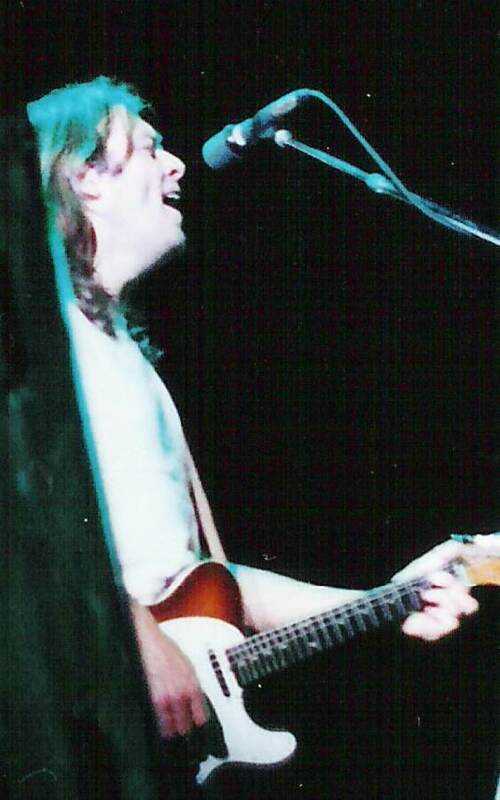 Pigs On The Wing (Part 1): Roger doffed his signature Precision bass and put on headphones and an Ovation acoustic guitar. The crowd was a bit large for such a change in dynamics and there were whistles and shouts throughout the tune. Fighting feedback and constant shouting, he softly muddled through. Dogs: During that echoing, "Stone...stone...stone...", in the upper corners of the stage, consumer goods and people slowly inflated... an obese, pin-striped man and the front end of a Cadillac slowly puffed out. When the music came back in, the car hood opened up and inflated snakes burst out and hung down grotesquely. The crowd went nuts. 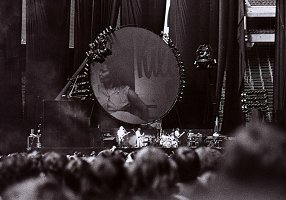 Pigs On The Wing (Part 2): Again with headphones and his acoustic, Roger attempted to have a quiet moment with 90,000 of his closest friends. He tried several times to start but the din was unrelenting. When someone at the back let off a barrage of firecrackers, he lost it. He stopped and demanded that they go outside to let off their fireworks because people wanted to hear his tune. "I want to hear it", he concluded. The audience cheered in loud approval and the song resumed without further interruption. 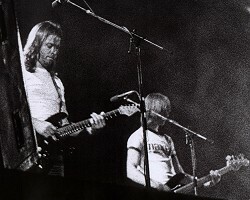 Pigs (3 Different Ones): I was surprised when Roger picked up a black and white Strat and Snowy switched to bass. Of the four songs they’d played so far, Roger played bass on only one of them. The fireworks seemed to subside and a pig floated overhead as David played some of the best solos I’ve ever heard him play. They really burned during that tune! As the song wound down, and they were doing a quiet vamp, Roger became... demonic. He called into the audience and pointed at a kid somewhere off to my right - just in front of him. He called the kid up to the stage, like you would a dog. "C’mon boy... come back... all is forgiven... just a bit further... there’s a good boy..." I could see an exuberant teenager climb over the barricade and with the help of a roadie, he was lifted up to the edge of the stage. I’m sure he thought he was going to meet his idol... until Mr. Waters let fly with a wad of spit that was as remarkable for its volume as it was for its accuracy. "Sch-plaugh" - right in the kid’s face! Dazed, the kid was tossed, like garbage, back over the bars into the darkness. The song ended, the band retired for a 20-minute break and I was left trying to process what I had just seen. Shine On You Crazy Diamond (parts 1-5): This is my favourite tune of theirs so I was taking pictures like crazy here. David was playing a tobacco-burst Telecaster. It started off a bit shakily as David seemed a bit distracted and his playing suffered - briefly. I started to appreciate Snowy White a lot more during this song because he added some beautiful fills behind David’s soloing. Welcome To The Machine: Pretty much like the record. Have A Cigar: Not a highlight. 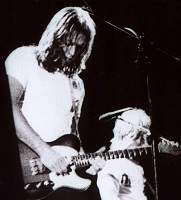 David played rhythm and Snowy provided the solos, which tended to be fast, but extremely repetitive. Wish You Were Here: The intro was cool. Next to Nick’s drum kit, there was a transistor radio mounted with a microphone pointed into its speaker. Nick twisted the dial and stopped at local stations that were playing music he knew we’d hate. He stopped on Andrew Gold’s then-ubiquitous "Lonely Boy" and everyone booed. When he moved onto a Dinah Shore hit from yesteryear, suddenly "Lonely Boy" wasn’t so bad. 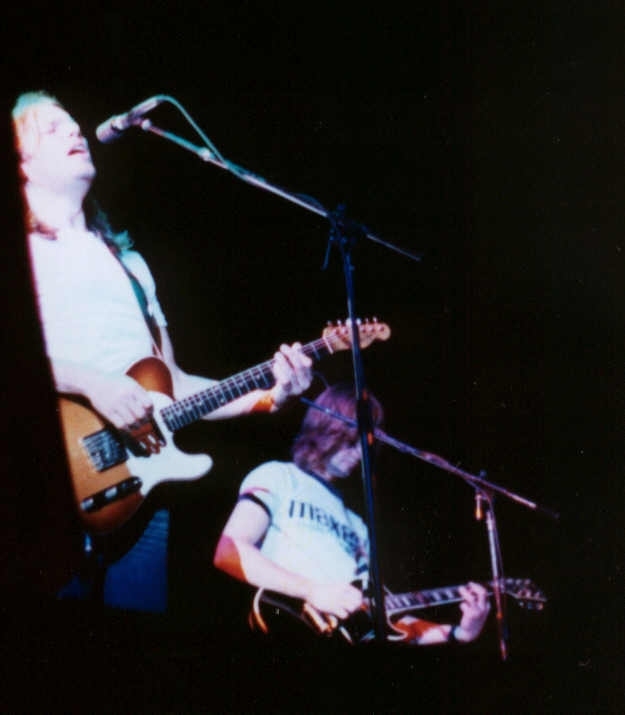 Snowy played rhythm on an Ovation 12-string acoustic and David soloed on the Strat. David also attempted some vocal showmanship on a certain phrase but it came out rather badly. Shine On You Crazy Diamond (parts 6-9): This tune was both great and terrible. When David was on the steel guitar, he kept losing his place and had to regroup. Roger even made mention of this when he sang "Nobody knows where we are..." and then he was overcome with uncontrollable laughter and could hardly complete the lyric. It got better here though as some of the best moments for me happened with David belting out a wicked, extended solo. It was the last official song of the night. As it ended, the house lights came on and ninety thousand people immediately began to demand "more!" Money: After about 10 minutes, they returned to the sounds of coins and a cash register - which sent the audience into spasms. The house lights stayed on for the duration of the show. 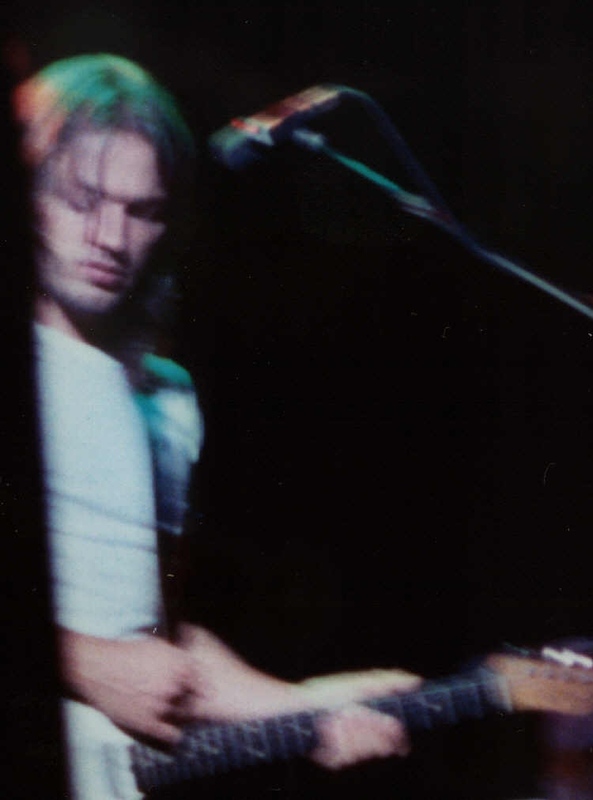 By this time, even the outwardly tranquil David Gilmour seemed irritated. The rear screen projector didn’t come on until well into the second verse. When it did come on, it caused spontaneous cheers, and an indignant, "It’s about time!" from Mr. G.
Us & Them: (Second encore) While the crowd could accurately be described as a "beast", it was more noisy than dangerous. It was a huge party atmosphere - but they wanted more. Cries of "’Ostie - Pink Floy!!" came from the locals. Maybe this was misinterpreted because when they finally returned, Roger said they’d do a quiet one so they could "end this thing peacefully". (Never at any time did I see anything threatening, nor did I ever feel threatened - and I was right in the thick of it!) 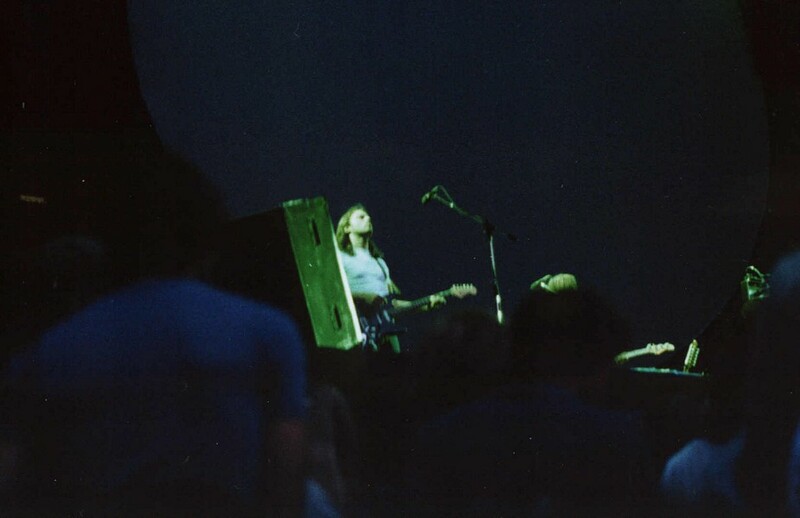 I’d already started inching my way back to the exits and when they came back on, I was right beside the soundboard so I remained there for the rest of the show. It was an odd scene - the rear projector on and smoke emanating - but the house lights were all on. 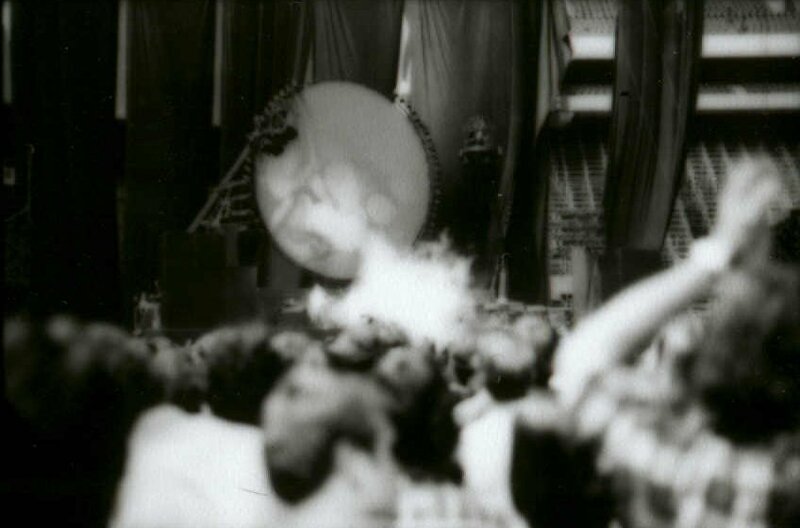 When "Us & Them" ended, the roadies began to tear down the stage but the chants of "more... more..." and "’Ostie!!" continued. Blues: (Final encore) David never came back. I’ve read that he watched this song from the soundboard, but I was right there and I didn’t see him. While Snowy, Roger, Nick and Rick played the blues, roadies quickly tore down the equipment around them. 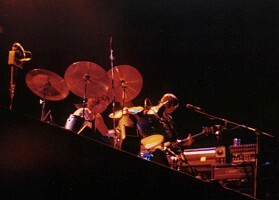 By the end of the song, only Roger and Nick were left - Nick was down to just a snare drum and high-hat. Roger’s flat "Good-bye!" signalled the end of an unforgettable night. It wasn’t the first time I’d seen Pink Floyd and it wasn’t the last. It was, however, the last time I’d see the line-up that I’ve come to believe is the best of their live incarnations. Now, nearly three decades later, I know it’s also the most significant concert I ever attended. Seems it was rather significant for Roger too. All text and pictures © Wray Ellis and exclusive to Brain Damage. No unauthorised use of any elements permitted. Wray has had some questions as to why it has taken so long for these to appear. 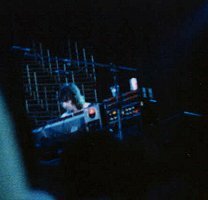 "After the concert, I enlarged the two of the best shots and stored the negatives away for 'future' use. When I graduated from college in 1978, I went on the road as a touring musician. Two and a half decades passed. This past winter, I finally got around to doing something with these pictures. With such renewed interest in the band in general (and this concert in particular) the time just seemed right.